This vintage 1915 era postcard holiday postcard is a nice one! It's nicely embossed with bright colors. 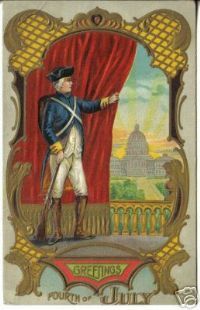 A soldier with rifle pulls back a red drape to show the Capitol in the background. The front reads "Greetings Fourth Of July". A nice old July 4th postcard view! Back has a divided back and is postally unused. Condition is very good as shown, but has a slight crease at upper left. Any other lines or waves are from the scanner and not on the actual image.